DAY 2: SRINAGAR / GULMARG / SRINAGAR: - Day trip to Gulmarg. Full day at leisure to take the leisurely walks on the lush green meadows of flowers with a backdrop of the snow-capped mountains. 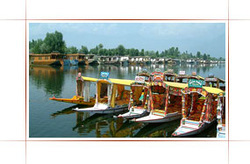 Enjoy pony ride or Gondola ride (rope way) to Khillanmarg at your own cost, evening back to Srinagar at Houseboat.